I have an idea, can we collect donations to an orphanage? I managed to get a half-decent picture of the award and a happy chick so I thought I'd post it here for posterity! 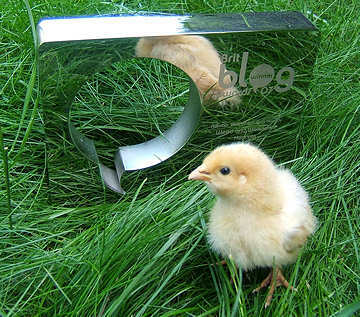 HENCAM WON THE 'WEIRD AND WONDERFUL' CATEGORY OF THE BEST OF BRIT BLOG AWARDS 07!!! It still hasn't sunk in - I never win anything - but I'd like to think that we all won this, I count you all as friends and hencam would have stopped a long time ago if it hadn't been for you guys, you make it all worthwhile. It's quite funny if you think about it, as the real stars of the site don't even have any idea of their prestigious award - though they might wonder why they've been treat with a huge bunch of grapes later today! 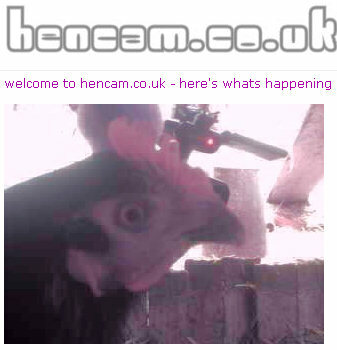 hencam is BBC Radio 2's Webcam of the Day! We are absolutely thrilled to tell you that today hencam was BBC Radio 2's Webcam of the Day! At one point we had nearly 50 people watching the live stream simultaneously - ouch! 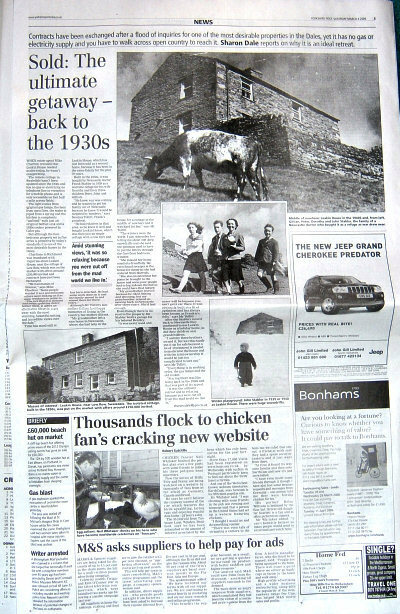 Those lovely supporters of hencam, the Telegraph & Newspaper (Bradford's local newspaper) have covered the recent hatchings at hencam with a written article and also a video! This morning I visited the studio's of BCB (Bradford City Broadcasting) and was interviewed live on air! Unfortunately (or fortunately!) I haven't got a recording of it. 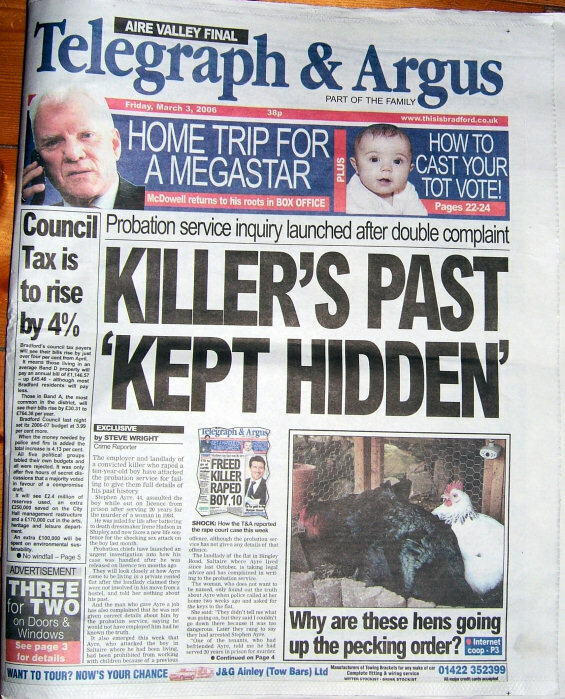 We love the Telegraph & Argus! 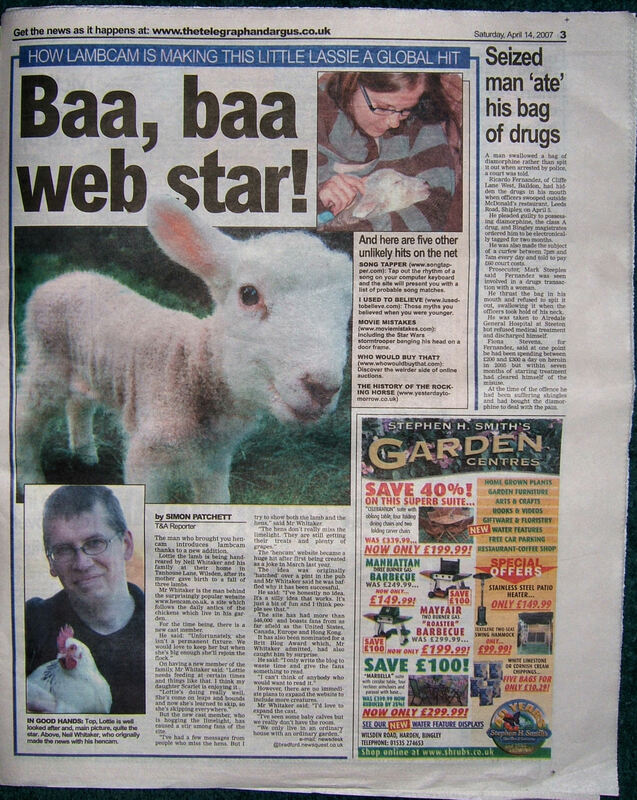 This weekend's edition of the T and A (Saturday April 14th 2007) featured hencam and Lottie the Lamb in particular! 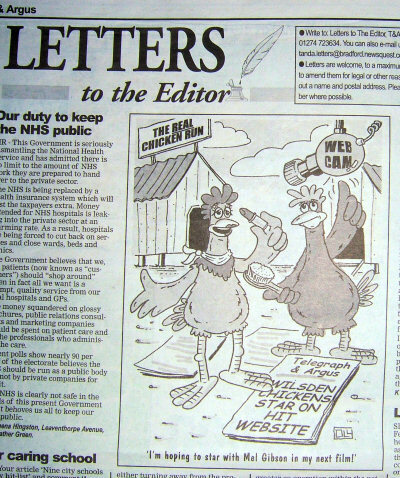 Thanks to the T&A for the great coverage, it's much appreciated as always, and we hope it spread a bit of humour at the silly happenings here! Thank you to the Guardian (a very serious and sensible paper for intelligent people!) ran a story on pointless websites (mainly covering the 'watch a cheddar mature' site), but they also listed other webcams, and we were mentioned - yay! I'm not sure about 'brilliantly boring' and 'the cult of banality' but I can sort of see where they are coming from...! hencam.co.uk is Kerrang! Radio's website of the day! Thanks to Ugly Phil and Rachel from the breakfast show, and all at Kerrang! 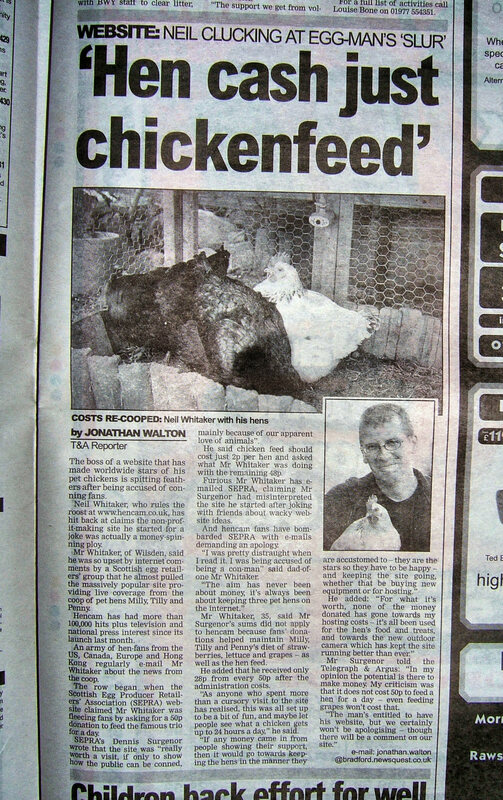 Radio who chose hencam as their "website of the day" and also interviewed me too for the show! Don't forget, the Look North TV hencam spot can be viewed here too! 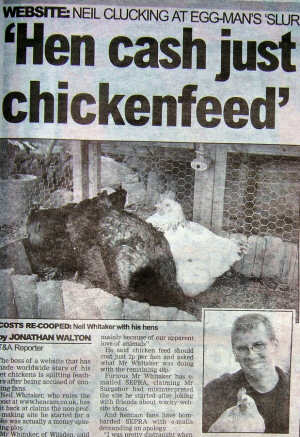 I would also like to answer Mr Grosvenor's comment in the T&A re: "My criticism was that it does not cost 50p to feed a hen for a day - even feeding grapes won't cost that" - actually there were SEVERAL issues you raised (which I answered in my original email) - you conveniently ignore the ones you cannot defend and cling to the cost of food issue. 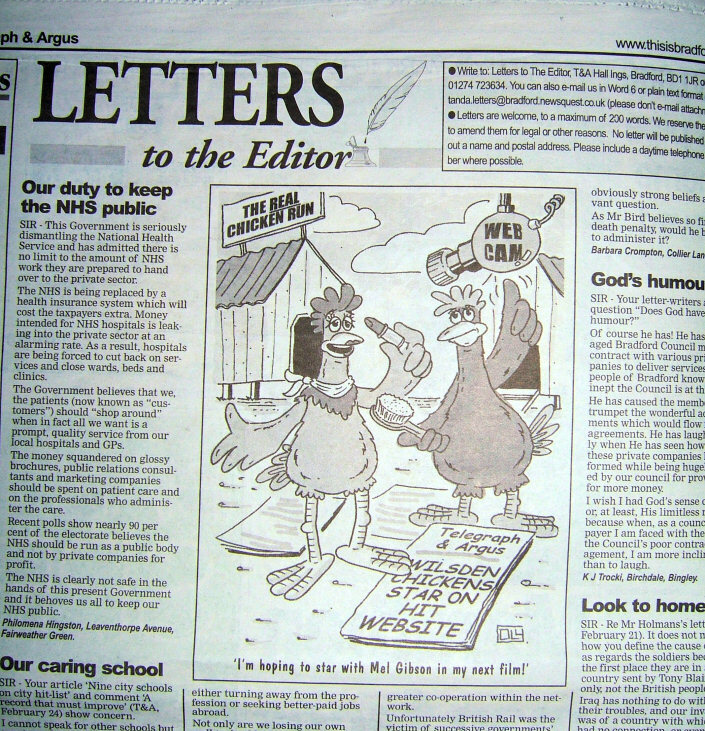 It's true that hens don't cost much to keep on a day to day basis (in fact it's chicken-feed! 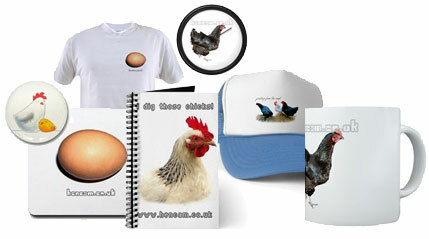 ), but people know that - they are donating to provide treats and whatever else the hens might need. Do you really consider the public so stupid as to blindly donate to a website willy nilly? Credit them with some intelligence please! 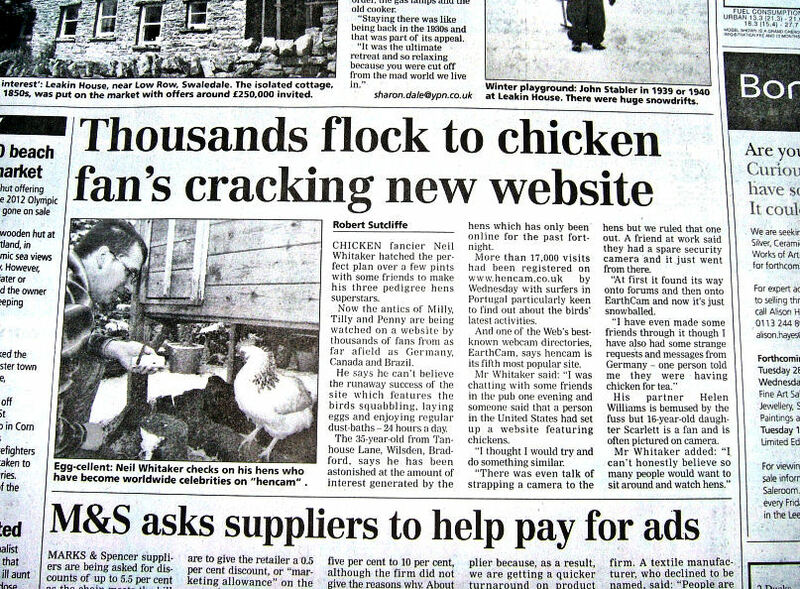 It might be the Yorkshireman in me but I will be damned if I will sit here whilst your website prints completely unjust and potentially libellious drivel regarding what I spend on my hens to give them the best possible care - when you yourselves represent battery and cage hen farmers. My hens are NOT a means of income - they are much loved pets. The T&A were lucky even getting a response from you, you've conveniently refused to answer mine or anyone elses emails on the subject. The Telegraph & Argus (Bradford and it's surrounding areas most widely read newspaper) rang me the other day asking if they could do a follow up piece on hencam. They were the first newspaper to feature hencam and started the whole ball rolling, so how could I refuse? They were very interested in SEPRA's hatchet-job on my site - hopefully the article will show the SEPRA people that they cannot make unfounded allegations against an individual or website and then refuse to answer or apologise for their completely incorrect assumptions. bringing a bit of fun back to the Internet. twice and enourage you to research your facts more fully in future. In the meantime, please feel free to contact him and see if you can get a response. If you feel email just isn't getting the message across, you can phone on +44 (0)1324 715337, or fax: +44 (0)1324 874773. Let me know how you get on! 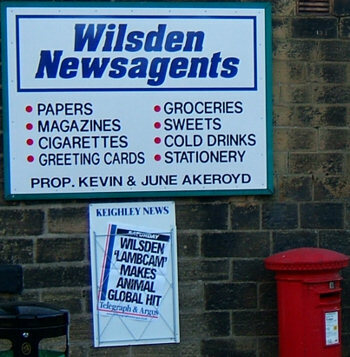 The Pulse (West Yorkshire's main commercial radio station) saw the article and emailed me to arrange an interview which I've just got back from. It covered why I thought SEPRA had such a bee in it's bonnet and whether I was going to sue them!! Interestingly, the quote they used was from a question they asked after I'd said that the merchandise was just 'for a laugh' - "how much profit would you make if you sold 50 t-shirts?" and I replied it would be about £15 - they used this which made it sound like the shop had made more than it actually had, although I think their point was that it still wasn't a lot (the final quote from the presenter was "so you won't be buying that ferrari and retiring just yet then")! I tried to record it but the stupid audio recorder cocked up, however it was aired on the 7am, 8am, 9am and 10am news bulletins. Here are the clips from the BBC Look North news programmes! The first one is from the lunch-time edition, there was a longer piece on the evening show too! This morning the hens (and Scarlet and me!) were filmed for a piece which will hopefully be on tonight's BBC Look North programme! I am shocked/bemused/amazed that a silly idea like this can snowball and receive so much attention, but I'm over the moon of course! Milly laid an egg too, she's either showing off for the camera or Tilly and Penny are *really* lazy! 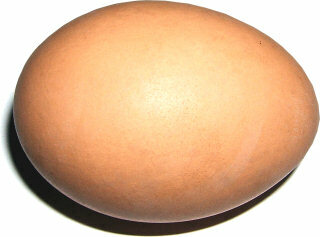 (year totals: eggs: 9, laid by Milly: 9, laid by lazy good for nothing Tilly and Penny: 0). Listen to my interview with Jack & Ali at Spin 1038! No sniggering at the back!! I've also found out we were mentioned on Tuesday's Breakfast show on BBC Radio Lincolnshire, and also on CBC Radio in Canada!!! I'm totally amazed and completely 'flummuxed' by it all!!! Today it was the turn of very serious national newspaper The Guardian!! the girls make it on page 3 again! 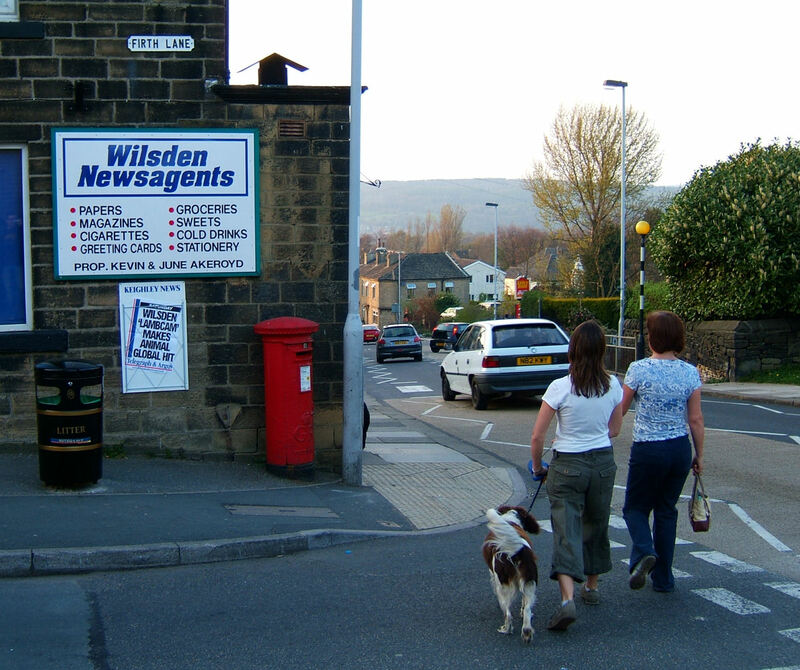 Milly, Tilly and Penny make the front page! The online store is open for business! The online store is finally properly open! There are tons of weird and wonderful goodies on there from t-shirts to bags to clocks to stickers to mugs to mousemats - you get the idea! If you want something totally unique (nobody has bought one yet!) then have a look and make Tilly, Milly and Penny famous!! Still no eggs, not really surprising as Tilly and Penny are getting on a bit now (over 3 years old, and modern breeds only really lay for a couple of years - after which they lay the odd egg every now and again) and Milly is 2 years old. The days have started to stay light longer on a night which is nice, so this should trigger their egg laying soon. I will be sure to let you know when they do!